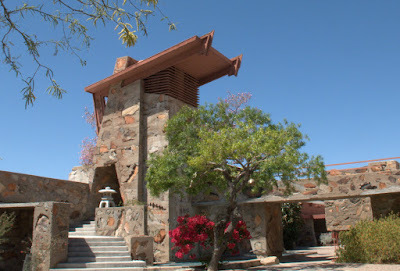 This was the original water tower at Frank Lloyd Wright's Taliesin West complex in Scottsdale Arizona. The complex served as the winter home for Wright and his family as well as the entire Taliesin Fellowship. Water was taken from a deep well Wright had installed in the mid 1930's and was stored in an elevated tank to provide water pressure for the complex. Canon G10, 1/250s at f/8.0, ISO 100. See more of my pictures from Taliesin West.